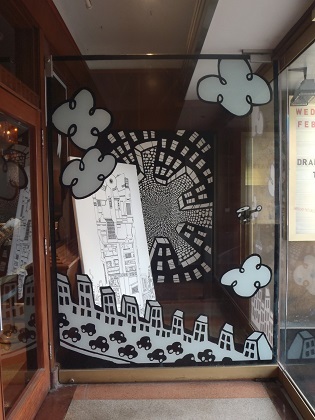 CARTOON MURALS SURREAL INSTALLATION! 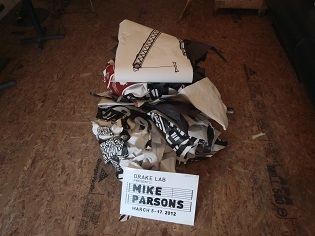 Artists Residency 2012. 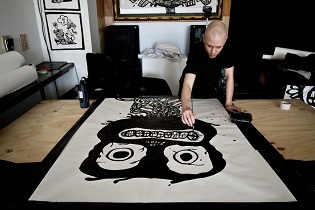 The Drake Hotel (Toronto) set up an interesting artist program in the summer 2012. 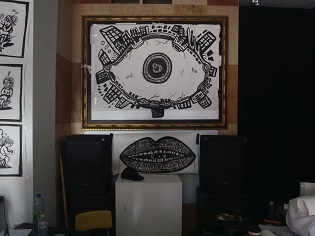 The Hotel had a storefront on the popular Queen Street West strip that was not in use so they lent it out to a number of artists to create pop up installations. 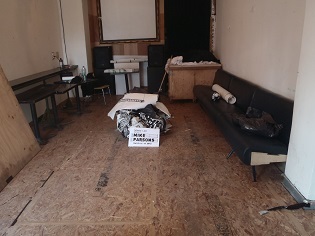 Rotating every two weeks the space housed various projects including music rehearsals, recorded interviews, a makeshift photography dark room and several exhibitions. 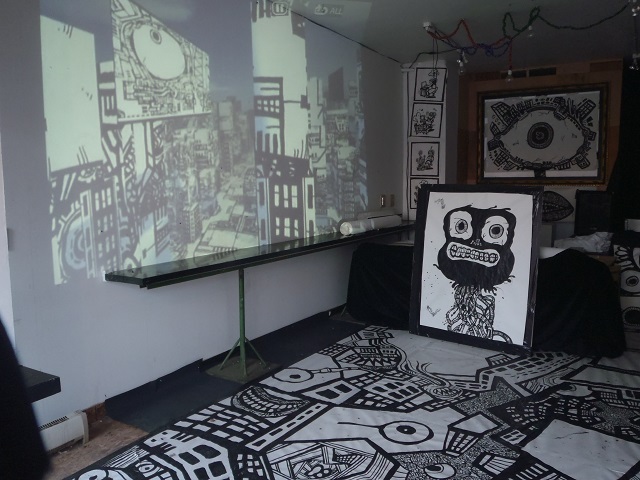 For my installation I decided to cover the room with blank paper and spend the time trying to fill the entire space transforming the room into an imaginary cartoon environment. 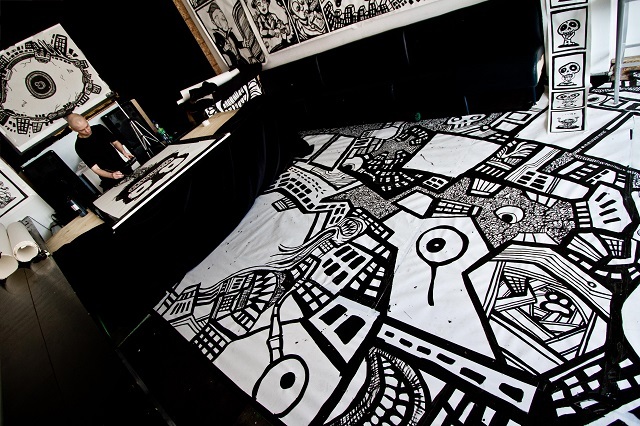 Working with the theme "Cycles of Life" I embarked on an ambitious artistic attack involving a giant floor mural, life sized comic book panels, numerous ink drawings as well as animated artworks and video projections. The "Cycles" theme was inspired by the site specific location for the project. 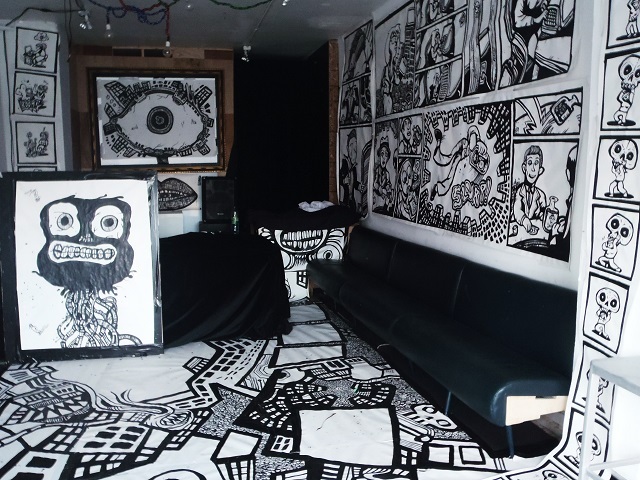 Not only was the store front in continual rotation between artists but the entire area was actually in flux. The block of buildings where the store was located was awaiting a major facelift with pending building permits and the huge strip of land across the way was completely inhabited by mechanized dinosaurs constructing condominiums at an impressive pace. 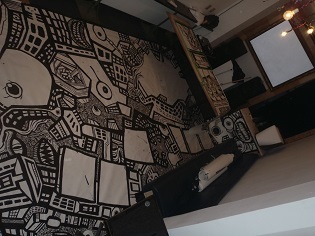 I started the installation by creating a mural to cover the entire floor. I used a lot of gear and wheel shapes on the floor setting the tone for the entire piece. Amidst the spiraling signifiers I incorporated various other symbolic images including people, bricks, computer chips representative of various cycles of life and construction. The complete floor painting measured approximately 1500 sq. feet and tool 8 hour to complete. 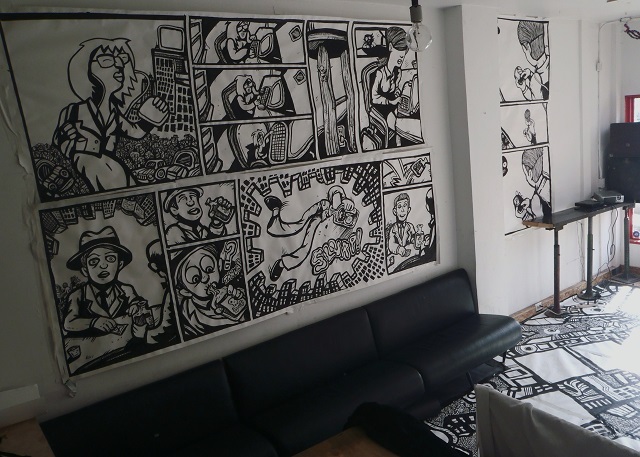 On the second day of my residency I decided to cover the walls with a series of life-sized comic book drawings. Again these cartoon murals explored the "cycles" theme featuring a series of characters either caught in or destroyed by repetition. A business woman is annihilated by routines before being replaced by a new eager employee, a barfly disappears into a bottle where he proceeds to be drunk by the following customer and teenager turns into a text message only to find himself in the hands of another. In addition to these perpetual strips I also made large scale comics satirizing more progressive cycles such vanity, technology, death and construction each contributing to the theme in a different manner. 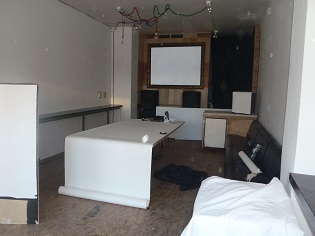 I made all the sequences silent knowing that I would be in the studio the entire time that it was open to the public I thought it would be more exciting to narrate the stories orally in order to engage and entertain anyone who came in. 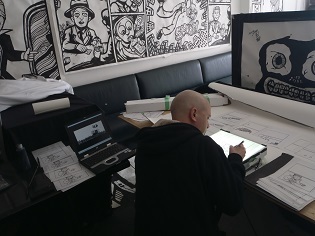 I generally would let them examine the work and guess for themselves first before offering the intended explanation .It was a really fun process I made 4 life-sized comics and 5 smaller wall sized works which covered the majority of the store wall space. 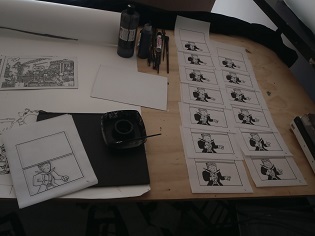 Following the floor and wall comics I proceeded to use the studio as a work space. I set up an animation studio using a light table, digital camera and laptop computer. I spent one day using traditional stop motion animation techniques to do time lapse videos of some large monster drawings. These were basically process videos in which the artwork appears to be drawing itself. The next day I started working on a series of classical hand drawn vignettes. Over the next few days of the residency I finished over 400 small stills completing several minutes of looped animations. 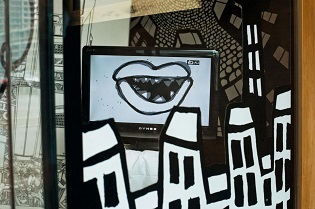 At the end of each day I projected the animations on the wall and succeeded in filling the entire storefront. All of the work was done with pen and ink or markers on cheap drawing paper and at the end of the experiment I destroyed everything leaving only a giant ball of crumpled paper and a USB key full of photo documentation.